Reading time: 620 words, 3 pages, 2 to 3 minutes. Until now, there have been no major Atlantic hurricanes this year. However, a tropical storm in the mid-Atlantic intensified into Hurricane Joaquin which gained strength as it approached the Bahamas. Two days ago, it was forecast to become a Category 1 hurricane approaching the U.S. East Coast. You can see an earlier forecast storm-track below. Given these complex interactions, it is too soon to accurately forecast landfall on the U.S. East Coast and there is still a chance it could turn and blow out to sea. In any case, parts of the East Coast are already getting hit with rain and wind gusts typical of a frontal system and are likely to continue for a few days. If you have friends or family living or travelling to the East Coast, please alert them. The latest Tropical Storm Risk forecast below shows Joachim’s eye bypassing landfall. We should remember that the 2012 Superstorm Sandy that caused such extensive damage was also influenced by complex weather interactions. Sandy turned sharply inland at the last moment despite prevailing winds that normally push storms offshore. Will this become another devastating hurricane like Superstorm Sandy? That also is too soon to predict, but there are some differences. 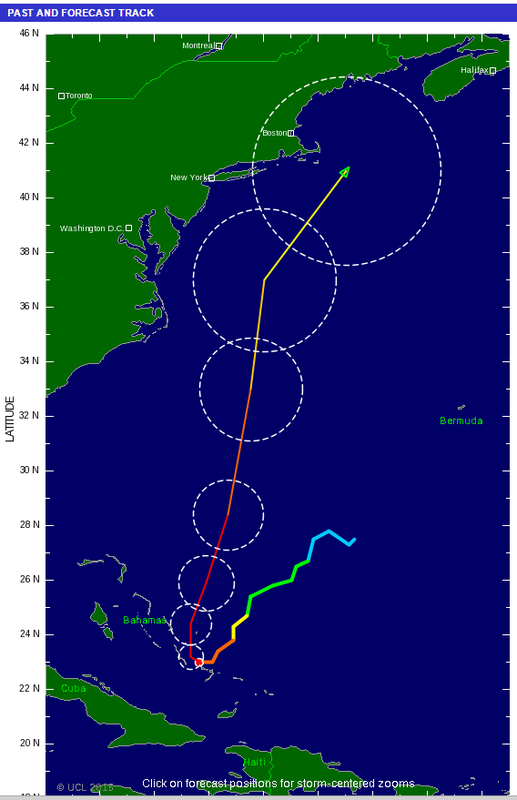 Sandy had a much larger wind field diameter of 1,000 miles compared to Joaquin’s present 230 mile diameter. However, that too could change over the next several days. 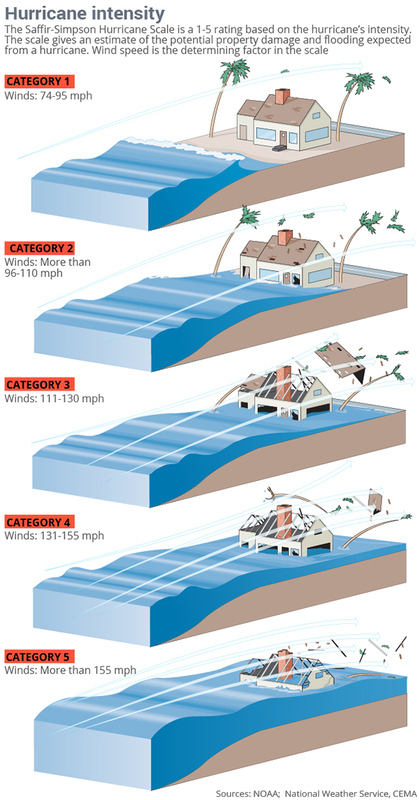 Hurricane intensity by Categories 1 to 5 are shown below. Parts of Canada will likely also be impacted. Global News reports that the Canadian Hurricane Centre “is keeping a close eye on Joaquin after New Brunswick experienced heavy rains on Wednesday. The system brought the same heavy rain to Nova Scotia on Thursday.” They should have a better forecast by Saturday. 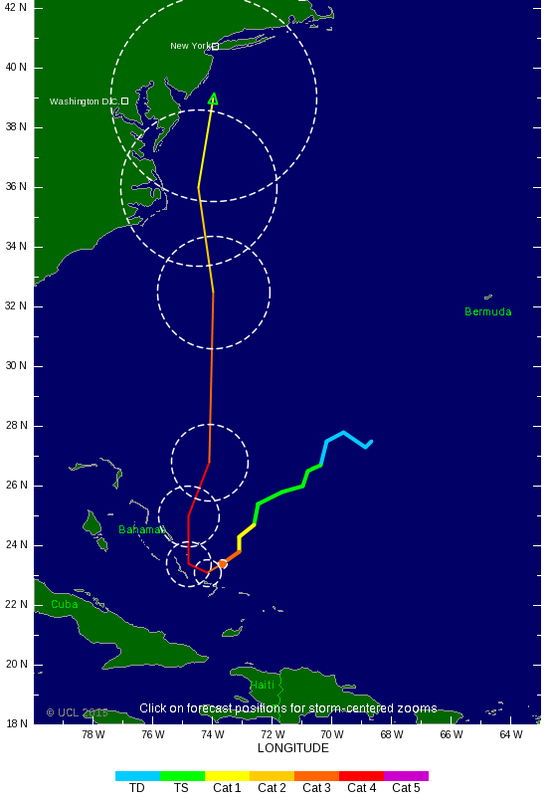 This entry was posted in News & Views and tagged Hurricane Joachim. Bookmark the permalink.